Nominations have now closed in the quest to discover the ‘Top 100 UK Christians’ for 2014. Hundreds have been nominated – some with sarcastic citations (Sir Cliff Richard – “For not singing at Wimbledon and not inflicting a Christmas record on us”; Bishop Alan Wilson – “He has a beard. Jesus had one too”); a few ineligible because they died way before 2014 (William Booth ; David Watson ); still others disqualified because they are either not British (Jesus) or Christian (Rabbi Jonathan Sacks). But most were nominated with eager and effusive testimony: their witness for Christ and service for the Kingdom has evidently touched the lives of many, often in unknown and unknowable ways. The lack of theological exegesis and biblical context is surprising, coming from some. James and John were expecting an imminent Parousia to establish Christ’s Kingdom on earth. They were eager for personal power and glory: they presumed to promote themselves to places of honour. Naturally, all of the Disciples wanted to know what was in it for them (cf Mt 18:1-3; 19:27-30). Jesus made it clear that God honours those whom He wills: not even the Son gets to choose who sits at His right hand. There is nothing here about Christians being forbidden from recognising the profound witness or honouring loyal service of others. The injunction is against seeking recognition and honour for onesself. Those who seek to be first must place themselves last; those who desire to rule must become servants; those who desire personal power and glory must turn their ambitions toward blessing others and take pride in that. Of course, the Kingdom needs leaders and so does the Church. And such an ambition is laudable: “This is a true saying, If a man desire the office of a bishop, he desireth a good work” (1Tim 3:1). The desire is a vocation, and that must be discerned with humility: recognition must be bestowed by others. The #CranmerList2014 is not about dishing out accolades to your favourite preacher or rewarding life-long service: very many would be deserving and we would need more than 100 places for all worthies. It is called the #CranmerList2014 because the intention is to make it an annual list to recognise profound and remarkable Christian or service in a given year, thereby mitigating assertions of hierarchy. You may think that Her Majesty the Queen deserves to the top honour: the question would be: ‘How has she distinguished herself this year?’ Those who insist that such a pursuit is “anti-Gospel” or “anti-Christian” or “of this world” are free to demur. But the concept of ‘celebrity’ is as Christian as it is worldly. The word may have been demeaned by X-Factor ephemera and the eating of live witchetty grubs in the jungle, but consider some of the greatest preachers throughout history – John Wesley, Charles Spurgeon, Jonathan Edwards, Martin Lloyd-Jones and George Whitefield. Or further back to Martin Luther, Jean Calvin, John Wycliffe and John Knox. Or further back still, to St Stephen or StPaul. And what about Jesus? Didn’t you need to be a celebrity in 30AD in order to attract crowds of 5000? Power lists of the Top 100, Top 50 or Top 10 may be part of what we call ‘celebrity culture’, and they may be obsessed with assertions of identity or the propagation of minority interests. But, for good or ill, that is now the dominant culture of the Western world, and Christians either adopt, engage and transform it, or shun, denounce and pour scorn upon those who might see a missiological opportunity. Since the world has celebrities, why shouldn’t the Church? If the world spreads its message through fame and renown, why shouldn’t Christians promote worthwhile ministries or recognise those individuals whom the world often overlooks? To inculurate is not to compromise: it is to become all things to all people in order that they might be saved. You may think the ‘Top 100’ anything to be artificial and contrived if not idolatrous, and you would be right. The majority tend to hanker after high placements and use that honour to gain more fame, power and wealth. The motive is Mammon and the cause is self. That is not the case with #CranmerList2014: certainly, there will be flawed and imperfect people upon it, for all have sinned and fall short of the glory of God. You may not agree with their theology, denomination, opinions or lifestyle. But there can be no doubt – this year at least – that they have witnessed for Christ or served the Kingdom and impressed one or more sufficiently to merit a nomination. Of course, many will have witnessed and laboured in the vineyard who haven’t been nominated. But this List is in its infancy, and its increasing fame may lead to greater harvests for the cause of the gospel in future years. ‘Top’ lists may work together for good with those who serve the Lord. Their ministry may be local, national or global; it may be wealthy or impoverished; known or obscure. By listing them, others might hear of their faith and good works (Col 1: 4-10), and still others might learn how to free a few more captives. The List is not to ‘make’ celebrities: it is to acknowledge the plain truth that some Christians have influence beyond that of others. They are not in any sense worth more or necessarily holier: it is simply that, like Timothy, they have distinguished themselves and word has spread. In 58AD, fame increased by word of mouth and written report: now it is by Blogger, Twitter and TV. Criticise the vanity and admonish the giddy method if you want to. Tear down the initiator and rejoice with those who denounce, impugn and rebuff. But please don’t assert that everything created must be ‘religious’, or that everything religious must conform to half-sighted notions of biblical exposition. If you are not famous in the world, don’t be jealous but rejoice in your obscurity. If you are not nominated for an honour, satisfy your heart with the peace that passes understanding. You will eventually win the race because you are an heir to the crown of life and will one day reign with Christ in glory. Until then, we have the fleeting ovations and garlands of the ‘Top 100 UK Christians’ to challenge and entertain us. It may be foolishly flawed and petty enough to excite the paparazzi. It may be offensively partial and unacceptably elitist. But it might also make known things which ought to be made known, and even disclose a few divine gifts. So, please don’t judge motives, intentions or sincerity, for that way surely lies the dark side. Nominations are currently being sifted, citations weighed and ministry discerned. 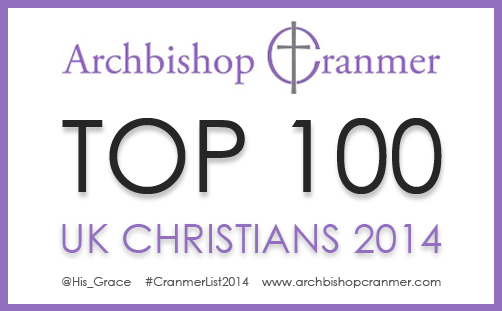 The ‘Top 100 UK Christians’ of 2014 will be announced to coincide with the world’s New Year Honours list.